Schools and other arts organizations are rising to the challenge. University law schools are hosting seminars on Ferguson. Colleges are addressing greater cultural and racial understanding in various courses. National education organizations and individual teachers are developing relevant curriculum resources, including the#FergusonSyllabus project initiated by Dr. Marcia Chatelain. Artists and arts organizations are contributing their spaces and their creative energies. And pop culture icons, from basketball players to rock stars, are making highly visible commentary with their clothes and voices. Where do museums fit in? Some might say that only museums with specific African American collections have a role, or perhaps only museums situated in the communities where these events have occurred. As mediators of culture, allmuseums should commit to identifying how they can connect to relevant contemporary issues irrespective of collection, focus, or mission. We invite you to join us in amplifying this statement. As of now, only theAssociation of African American Museums has issued a formal statement about the larger issues related to Ferguson, Cleveland and Staten Island. We believe that the silence of other museum organizations sends a message that these issues are the concern only of African Americans and African American Museums. We know that this is not the case. This is a concern of all Americans. We are seeing in a variety of media—blogs, public statements, and conversations on Twitter and Facebook—that colleagues of all racial and ethnic backgrounds are concerned and are seeking guidance and dialogue in understanding the role of museums regarding these troubling events. We hope that organizations such as the American Alliance of Museums; the Association of Science-Technology Centers; the Association of Children’s Museums; the American Association for State and Local History and others, will join us in acknowledging the connections between our institutions and the social justice issues highlighted by Ferguson and related events. When I was a little girl, I considered myself to be something of a playground connoisseur. Everywhere I traveled with my family, we would be sure to check out the local playgrounds. Favorites would warrant a return visit. Before my son could walk, playgrounds would tantalize us with their bright colors and promise of a joyful public realm just beyond our reach. Now that my son is a bonafide toddler, we are free to begin exploring the glorious array of playgrounds on offer in greater Atlanta. 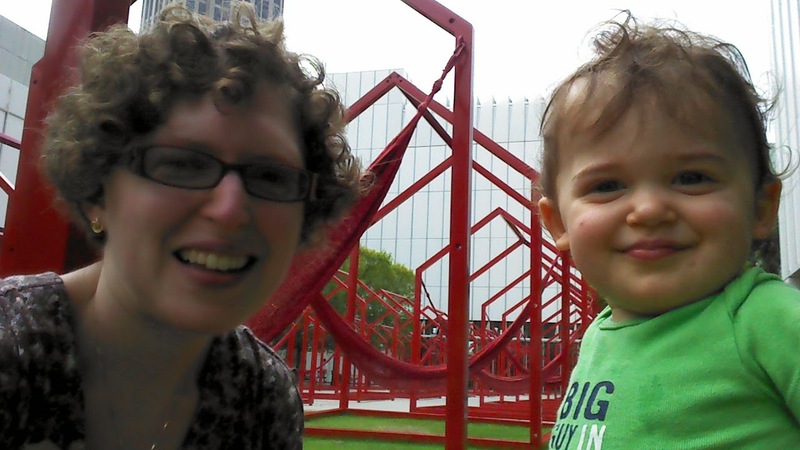 Future posts will highlight special places we go out of our way to visit, but this first post will outline our go-to playgrounds guaranteed to provide at least an hour of diversion for the two of us in Decatur. Next post will cover some of the Atlanta playgrounds we've visited thus far. 1) The Decatur Toy Park is owned by First Christian Church of Decatur. Although it is not technically a public park, it is free to enter and enjoy and is a frequent haunt of stay-at-home moms and dads, babysitters and nannies with babies and toddlers in tow. Although its centerpiece is a traditional playground and swing set most likely rated for 2-5 year olds, the park is the final resting place for every Little Tikes, Fisher Price, and off-brand plastic playhouse, kitchen, riding tractor, push-mower, and mini-slide you can imagine. The etiquette of the park ensures that "everything belongs to everyone" and children must learn to share as best they can, refereed by adults on the spectrum of checked-in to checked-out. The park is a proving ground that kids don't mind second-hand toys and that our cultural tendency toward gendering ("kitchens" for girls and "workshops" for boys) is rendered meaningless when toddlers are given a chance to explore all options. Ground cover: sod, blacktop, and mulch. 2) Although not a traditional playground, the Wylde Center Oakhurst Garden on Oakview Road, has a play area featuring a sandbox with digger toys and slides, and a unique Cobb playhouse made from earth and fitted with attractive nooks and crannies. The garden also features a pond home to frogs, a chicken coop with very friendly residents, and beehives. This is a peaceful destination for parents and young children offering many features to explore with few opportunities for real trouble. Other features: many different plants and animals. 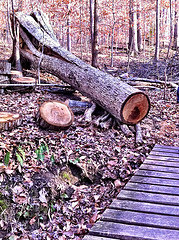 Natural trails to explore in addition to raised garden beds. 3) Scott Park is located in downtown Decatur, right next to the library and right behind the recreation center. This park is compact, located in a beautiful setting and very convenient to downtown. The play structure has bars that encourage young climbers to hold on tight as they ascend (and especially descend) the steps. The play structure also features musical drums and bells which are very popular with kids of all ages. There is a medium-sized slide just right for beginners and a higher tandem slide. There is also a great oval track around the whole park and picnic area that makes for a great place to stroll a sleeping baby until he/she wakes up. Play structure: metal and plastic. On the safer side for a new walker but with a few nerve-wracking precipices. 4) Adair Park on the west side of Decatur has a reasonably nice playground and a large playing field, but it doesn't have anything special to offer the youngest user. The playground is probably better suited for a slightly older child, and the location, between busy College/Howard Avenues and Ponce de Leon, is not ideal for someone walking from another neighborhood. Worth an occasional visit, but probably not a go-to local park for us. 5) Mead Road Park is a great place to practice walking on multiple surfaces. The landscape architecture is a little bit unusual with a large round mulched plaza for the two baby/toddler swings, a sunken playground, and a raised structure with picnic tables and trellises. Unfortunately for parents of toddlers, this park gets very crowded with rambunctious elementary school kids during the late afternoon. It can be a challenge to share the play structure with these older kids who often play fast-paced games of tag. This park is a reasonable place to explore, but can be a bit dangerous without very close supervision. Ideal age range: 5-12 most likely, but can go younger with supervision. Through a combination of family visits and afternoons with the manlet, I've had a chance to visit six of Atlanta's museums so far this past month. We have become members of the Georgia Aquarium and the Fernbank Museum of Natural History and have already visited both institutions more than once. Since the High Museum of Art and the Atlanta History Center both honor AAM memberships and let kids under 2 in for free, we will probably not purchase additional memberships for those, and since both Fernbank and the High are remarkably kid-friendly places, we probably won't return frequently to Imagine It! the Atlanta Children's Museum. I will likely return to the Center for Civil and Human Rights, mostly to view the changing exhibits derived from the Morehouse College MLK archive. In the remainder of this post, I offer quick reviews of the Georgia Aquarium,Fernbank and the High and a ,more in-depth review of the Center for Civil and Human Rights. The Georgia Aquarium straddles a line between carnival-like tourist attraction and bastion of marine science. When it comes to aquaria (and zoos) I tend to be a bit of a purist. Animals are beautiful and fascinating. They do not require embellishment. The Georgia Aquarium has an astonishing array of marine life exhibits. Some of its most exciting denizens include beluga whales, sea otters, and a large coral reef. However, the aquarium seems to feel the need to up the ante with Disney Princess giveaways in the lobby and advertisements everywhere for "exclusive" events and tours sponsored by a dizzying array of corporations. I find myself longing for a quiet space for contemplation. To be fair, we've only visited so far on weekends, so the place has been packed. And my one-year-old son has no problem gluing his eyes to the fish, pointing and grinning and vocalizing, whether from shoulder-top or backpack or baby k'tan. So I'll give the place a break. Leo loves Fernbank as well. The natural history museum has a classic array of dioramas depicting Georgia's deep history, an enormous light-filled lobby containing a dramatic dinosaur display complete with pteranodons ready to take flight, a changing exhibit gallery, and an IMAX theater. For Leo, the highlight is the NatureQuest gallery, a huge space for exploration of scientific themes and methods. I anticipate many happy hours with Leo climbing up the tree house, rebuilding ancient walls, and discovering geological wonders in rocky enclaves. The fun has just begun. 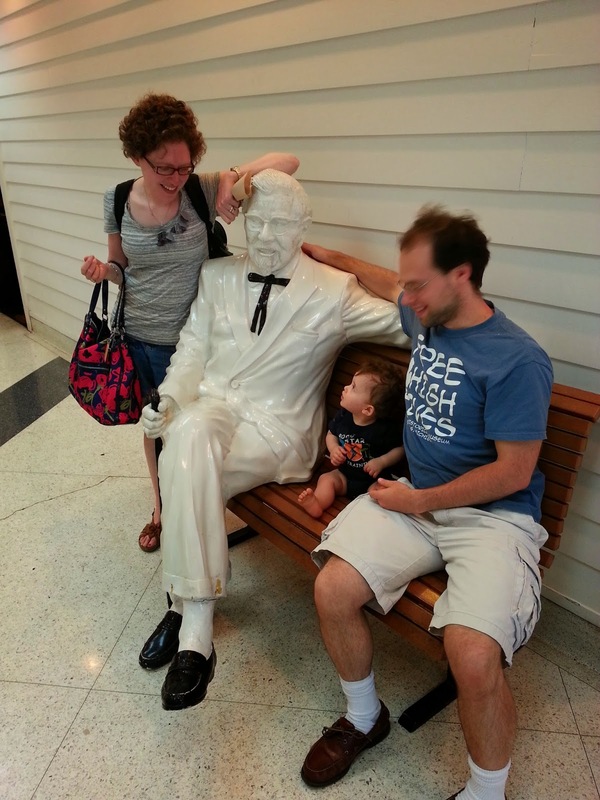 The High Museum of Art also offers a remarkably fun atmosphere for small children. The courtyard lawn of the institution is dominated by a whimsical art installation, Mi Casa Your Casa featuring bright red metal "house frames" most of which have hammocks strung invitingly across from corner to corner. Leo and I spent a good hour walking around from similar structure to similar structure and swinging on the hammock chairs. The museum also boasts a fantastic family education center with a walk-through painting, foam sculpture building blocks, a magnetic wall populated by "found objects" and more traditional dress-up clothes and kid-scaled, touchable artwork. However, the appeal of the High goes beyond its installations designed specifically for families. The complex's architecture is bright, airy, and fun to explore, offering unique vistas and approaches from every angle. It also features one of the best contemporary art galleries I've ever explored with meaningful explanatory text and appropriate amounts of space to view artworks. Leo and I felt welcomed by the guards in every gallery, and we found the staff to be friendly above and beyond the "call of duty." We spoke at length with a woman who works for the museum's food service provider. It was clear to me that she takes pride in her work and enjoys the collegial community at the museum. I'm looking forward to many hours of exploration. In contrast, I visited the Center for Civil and Human Rights with my father while Leo visited the aquarium with other members of the family. The Center boasts many excellent features and some significant drawbacks. One drawback that becomes clear upon entry into the institution, is that, although it embraces the term "center" for itself, it is really only an exhibition space. When I think of a "center," I think of a space with a significant research collection, a place to learn and to visit again and again. The Center has an air of completeness to it, a sense that its educational mission is a fait accompli with the only changing exhibition space being the dedicated gallery for items from the Morehouse MLK archive: personal papers and some disturbingly fetishized personal effects. The Center's gift shop is also disappointingly low on intellectual content. I expected deep dives into the history of civil and human rights and instead was presented with tee-shirts, mugs, and generic pamphlets and figurines. The Center's strength lies in the first part of its Civil Rights gallery and in aspects of its Human Rights gallery. The Civil Rights gallery opens extremely powerfully, making excellent use of audio and visual artifacts and exhibit design to convey emotional intensity. Oral history excerpts are also used to great effect and the exhibit text is written in an engaging and accessible manner without being "dumbed down." Although few physical artifacts are employed, the exhibits use constructed spaces and environments to convey authentic experiences. One particularly moving installation recreated the feeling of being heckled and abused at a lunch-counter sit-in. Another recreated the triumphant feeling of being part of the March on Washington and listening to Martin Luther King's famous "I Have a Dream" speech. The emotional and intellectual tenor of the exhibit remains high up until Martin Luther King's death at which point it begins to rush headlong toward denouement. The flow of the exhibit, which was masterfully paced previously halts abruptly, and details disappear from the exhibition's offerings. Very little is said about Black Power and the many riots sparked across the country by MLK's death. A nod s made to "legacy" in the Requiem gallery of the exhibit, but, although the interactive tables there have a lot of potential, they include little substantive content as of yet. There is so much room here to include oral histories and diverse legacies of the movement! I wonder whether the strange turn in the exhibition came from a sense that visitors will have likely run out of steam at the moment of MLK's death or whether there were budgetary problems or issues of narrative consensus? Given the strange feeling I had at the end of the civil rights exhibit, I was thankful for the comfortable resting place offered on the second floor balcony of the building. I was able to prepare myself emotionally for the Human Rights exhibit. The opening of this exhibit which used mirrors to enable visitors to "interact" with narrators with a diverse array of personal experiences with human rights abuses, was the strongest part of the gallery. Further in, there were some unique offerings, including an installation devoted to China's "Great Firewall" which I appreciated. There were also some digital installations which could use to have the kinks worked out of them and some overly didactic video areas. Overall, I think that the Center for Civil and Human Rights has a great deal of potential, but it needs to let itself become a deeper archive for the legacy of these evolving movements both in the United States and around the World. 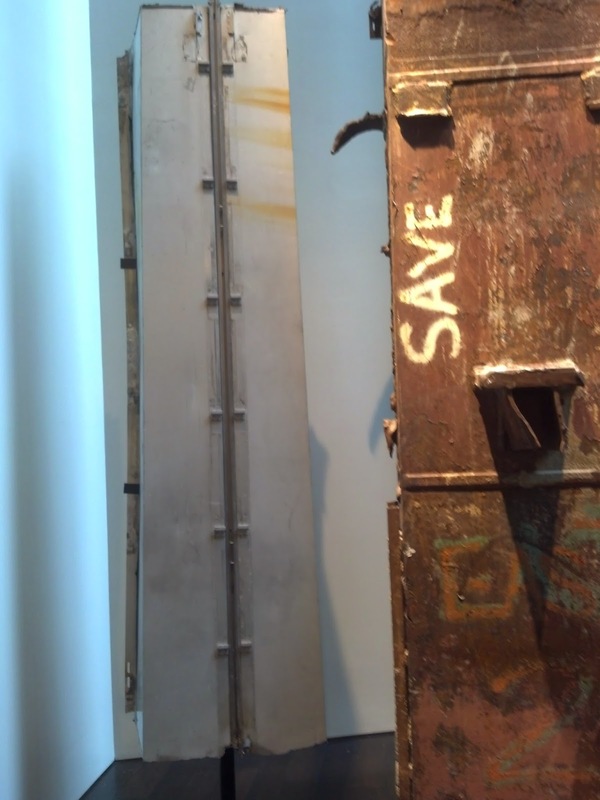 Last Thursday, at the tail end of a family vacation that took me to New Jersey, I visited the 9/11 Memorial Museum for the first time since its opening last spring. I visited alone, without my former colleagues, friends, or family, although I did stop first at the new offices of the Museum staff in the former One World Financial Center, now 200 Liberty Street. I had been careful not to read too many reviews before my visit. Adam Gopnik's contextual piece in the New Yorker was an exception. My immediate emotional response was one of relief. I found myself relieved that the museum has been built, that a place with such heavy potential energy has been realized. No longer is there a tremendous build-up of pressure and possibility. There is a museum. It is full of things, and sounds, and images, and people. The people are participant observers. They have come to learn and they appear respectful, introspective, intrepid. I observed numerous positive encounters between visitors and education staff. The space to cover is vast, dense in places. Where there is sufficient space for reflection, the impact is at its greatest. Where there is too much space, the pacing feels off, uncertain. The entry ramp that leads from the lobby level to bedrock unfolds with an odd pace, almost a punctuated equilibrium. It is not unlike memory, but not quite like it either. The overlooks (areas where the wall dips to the tower volumes and vistas below), with the exception of the glass wall over Foundation Hall, are too high for clear viewing by a person of my proportions (short), let alone a person in a wheel chair. However, the space from the survivors’ staircase through the memorial exhibition unfolds beautifully. 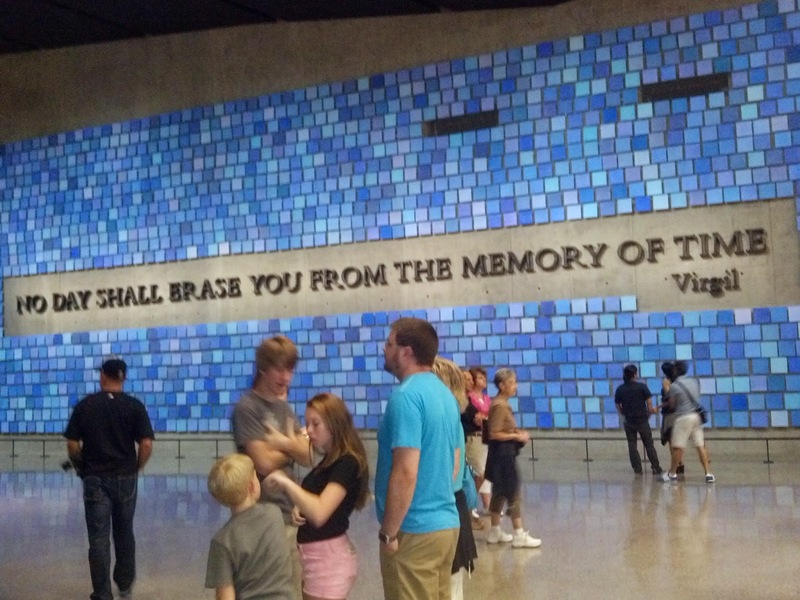 Spencer Finch's art installation on the east wall, surrounding the famous Virgil quote “No day shall erase you from the memory of time” is a slow reveal of emotional intensity. The piece is the only artwork commissioned for the new museum. At first I did not understand what I was looking at – blue tiles? Post-it notes? And then I read the description of the piece, “Trying to Remember the Color of the Sky That September Morning.” 2983 water-color paper squares. Each a different, unique shade of blue. The impact was complete, like a flood of water over a wall. The paper an echo of the fallen paper on 9/11 and the missing posters that appeared everywhere afterward. The color, subtly variegated. One for each human life extinguished. The act of repetition, an impossible task of remembering an impression – perception different for every individual. I didn’t know what I was viewing at first, but now I am glad for having viewed it. I cannot think of a better cladding for a wall separating the museum from the repository of human remains. The memorial exhibition, the part of the museum for which I was responsible for four of the 6 years I worked at the Memorial, was like slipping inside a model I knew like the back of my hand. The faces are bathed in a warm glow, and we were successful in obtaining so many images. I saw hardly any oak leaves, the symbol used when a photo could not be obtained, and most of the images were clear, colored, and lovely. It was not easy to view the names on the top rows, but they could be read easily in the interactive tables which worked beautifully, with only a few issues with the speed of loading content. The audio quality was clear and warm in tone, not tinny or harsh, even for the remembrances which originated with “Call toRemember.” My only complaint, something I had anticipated, is that the artifact cases felt unnecessarily small and cramped given the space that could have been used. This was especially true of the bonnet cases. 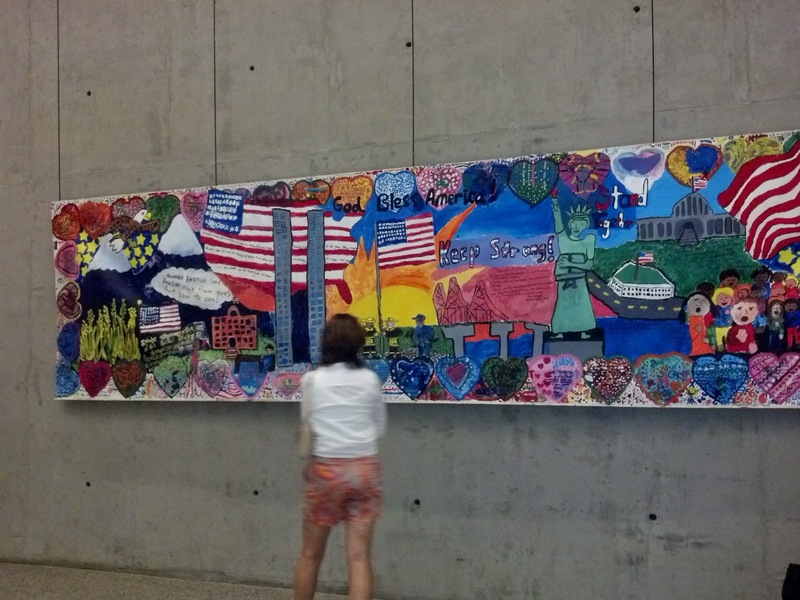 Leaving the memorial exhibition, I enjoyed viewing the quilts and banners in the tribute art hallway. I also loved the South Tower archeological gallery. The site’s sense of place was underscored through the design of that exhibit, and I hope to return to give more attention to the archeological aspects of the site in the future. During this visit, I opted to give only cursory attention to this exhibit in favor of advancing to the historical exhibition. 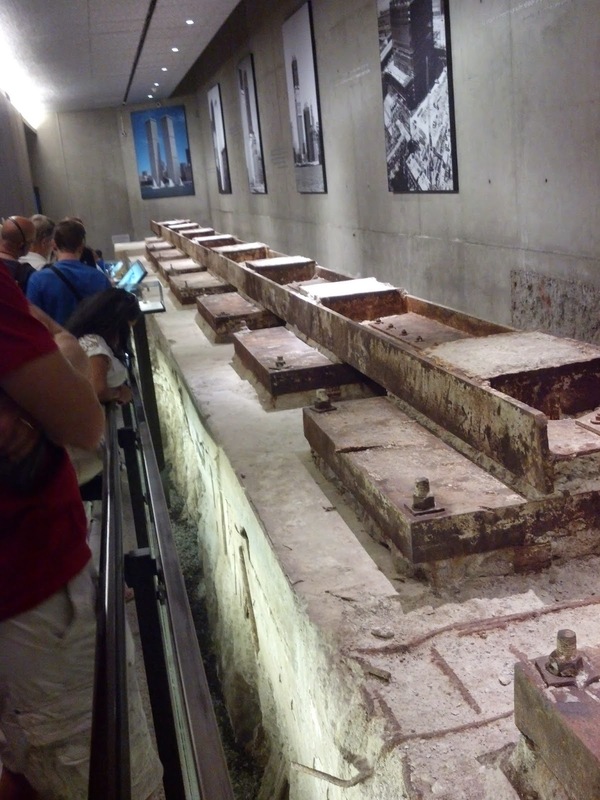 Compared to In Memoriam, the historical exhibition was overwhelming, with the exception of occasional moments that mimicked the feeling of safety and clarity in the memorial exhibition, namely the audio/video alcoves, especially those telling the stories of people inside the towers. The architecture of the jumpers’ alcove (space dedicated to the story of those who fell from the towers) was uncomfortably isolating and voyeuristic in the way it forced you to stand alone and look up. Perhaps this was intentional and the feeling produced was appropriate. Maybe there were just too many people in attendance at the historical exhibit, but it was difficult to find a clear path amid the chaos, especially in Part I. The outer walls were mobbed, and it was tough to focus on any one of the many images and tiny artifact spaces along the walls. I had no need to view the timeline myself, but visitors were clearly interested in its contents. (I did like the way the times appeared along the wall as you walked by them though). I longed for escape and was happy only when a space opened up along a wall for me to view an artifact of significance. It was difficult to find these stories though, on walls crowded with photographs and a very detailed timeline. That’s another reason why I appreciated the intimacy of the alcoves. On the main path, I felt both claustrophobic and agoraphobic at the same time. I was too exhausted to appreciate the story of Al Qaeda in Part II, although I really liked the gallery on the significance of the WTC. I appreciated the openness and choice offered in Part III, The World After 9/11. Perhaps this was all content-appropriate. 9/11 was chaotic and myopic, painful and confusing. Eventually we understood what was happening and what had happened, but not fully as the events were unfolding. In Part III we are free to focus on the myriad tasks of recovery and to ask questions about the meaning and consequences of these events. I appreciate how these questions were posed in the galleries. One moment worth mentioning that I appreciated at the end of Part I was the use of the audio artifact of the FDNY “Man Down” beepers. It was eerie and set the space apart from the present time. I did not like how the tribute art was crammed together at the end of the exhibit. In trying to get so much in, the stories were muddied or lost. I think I would have preferred one or two pieces on display on a rotating basis. One last impression: The interactive digital overlay for the Last Column worked beautifully and was very attractive and accessible for the visiting youth. I observed a young girl combing through symbols and exploring deeply. On my way out of the museum, I paused to look again at the towering tridents saved from the rubble of the World Trade Center. 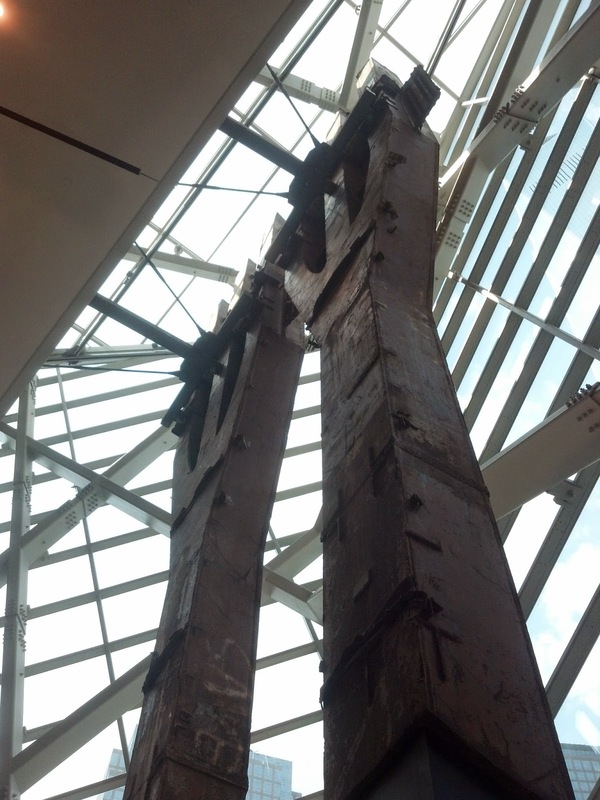 These steel structures stand as a microcosm of the 9/11 Memorial Museum experience, emblems of wreckage and the will to memorialize, marked by the process necessary to realize this dream of commemoration. Circling back to my first impressions, the security structure at the beginning of the museum entry felt like an installation in and of itself, although I would have appreciated some signage highlighting this further—something about how airport security changed drastically after 9/11. Perhaps it was there, but I didn’t notice it. So much of this museum is about signs and symbols. Things are not only what they appear to be or function as on the surface. They are imbued with meaning, often beyond the control of those who created or installed them. Such will be the fate of the Memorial Museum, and such a fate should be embraced. 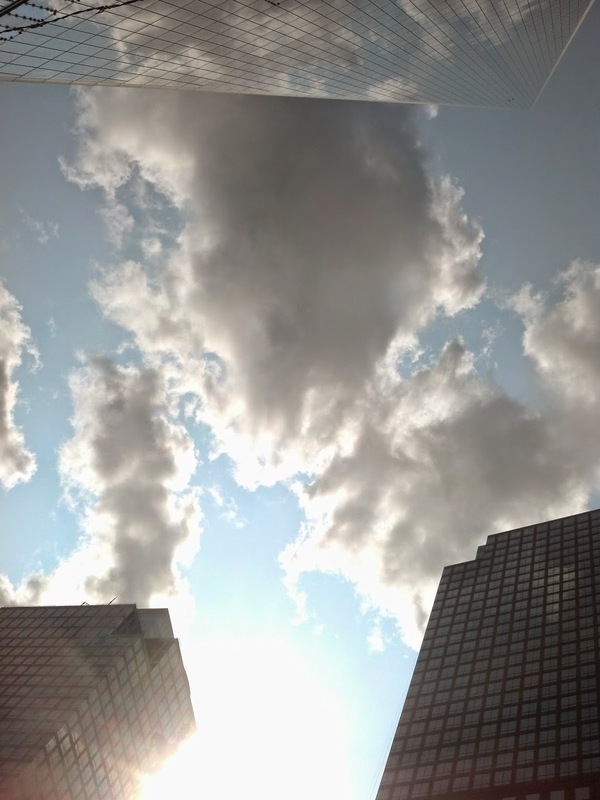 Walking back to the PATH train after my visit, I paused to look upward at the new One World Trade Center, its peak disappearing into the clouds. Below it, the memorial plaza is both more than and not more than a gathering place in the shadow of this new structure. All the people of the world pass through this space, and every time they pass, new memories go with them. This is a place where memories are born and reborn. This is a museum where ideas live.